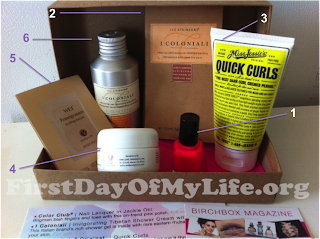 First Day of My Life: March Birchbox! Remember when I revealed my February Birchbox last month? I was kind of iffy about it. I decided to stick with it and try another month. I'm sure glad I did! For those who may not know, Birchbox offers 4-6 beauty samples based on your beauty profile. You also have the ability to let Birchbox know if you are interested in organic products or if you are prone to be allergic to beauty products. 1- Color Club - Nail Lacquer in Jackie Oh! I am LOVING this color and brand. I think it's gorgeous & it's perfect for spring/summer time. Full size is only $8 - which is totally do-able. Thumbs up! This smells pretty delicious! I have enough shower gel to last a life time, though. I know it's not shower gel - but it's close enough. I'm iffy - only because I do like the product but I could have lived without it. I am pretty much LOVING this product. I am not loving the price - $32 for a whole bottle...but believe it or not, I might cave and get some. I feel like it makes my curls look great and not wet...my curls are able to be natural and curly without being frizzy or "crunchy" from product. Oh and the smell is pretty amazing...reminds me of bar soap and lavender. Thumbs up! What do you think...how do you think it makes my curls look? I love that this product is organic! Too cool. It is a 2-in-1 cleanser and moisturizer. It feels very good on the skin - I do like that you don't need to put moisturizer on after washing your face! Full size is $58...ouch! Will have to say thumbs up though. I've never used anything like this before so wasn't sure what to expect. It sure smells good and feels pretty good, too! I'm iffy on this, though. I think because I've never used anything like this before. Yes pleaseeeee! This product smells so amazing and feels just as fabulous. Why does it have to be $70 though? Thumb way up! Four thumbs up & two "iffies" - successful Birchbox to me! How did you like your March Birchbox? You've sold me on that curl cream! I usually rely on massive amounts of John Frieda mousse and hairspray to keep mine under control. It works but It leaves my hair all stiff and unnatural looking. Oohhhh I love that nail color! I got tw same brand but in a turquoise mint and love it! Ive not gotten on the birchbox kick. I like your post with the reviews snd price. That polish is very pretty! Curls look great! Happy Friday! those are some pretty big samples! looks like a good box! Wow! It's amazing how different everyones boxes are. I got the teen vogue box this month and everything was awesome! That polish is pretty! Let me know how long it lasts you before it chips!! I love that nail polish - I have a little birch box envy this month! I neeeeed to sign up for birch box! You got such good stuff this month! That nail polish color is the CUTEST! I'm so glad you loved your box this month!! your nails look so pretty! love the ring too! hope you and v have a fun weekend! Your hair looks gorgeous, that stuff sounds great!